These Irish potatoes candies are a smooth, divinity-based candy with a white chocolate flavor and loads of toasted walnuts. 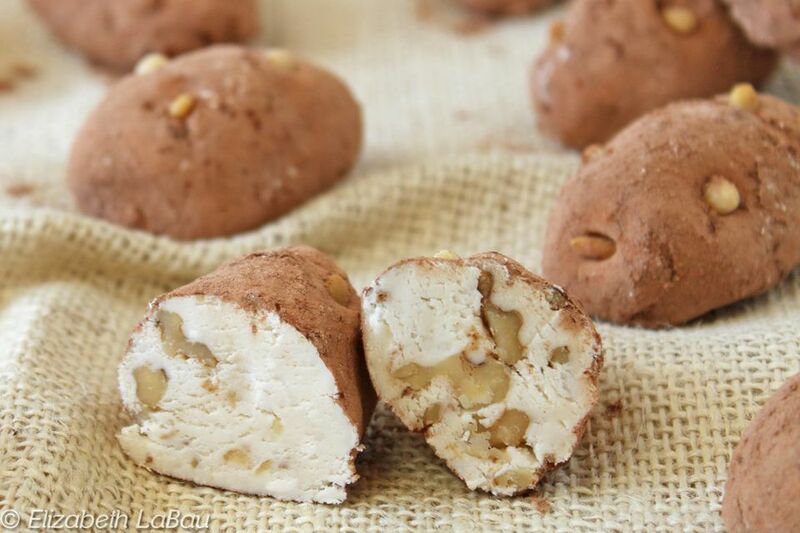 If you're familiar with the Irish candy potatoes from See's Candies, then this recipe will taste very familiar! The sweet potato look-alikes are rolled in a mixture of cocoa and cinnamon, and decorated with pine nut "eyes." This recipe begins with homemade divinity, and also requires a portion of candy fondant. You can make your own fondant using one of these recipes, or you can use purchased fondant that you buy at a craft or cake supply store. If you want to make your own, we recommend this recipe for marshmallow fondant, since it is so fast and easy to make. Note: while there are multiple steps to this recipe, this candy dish is broken down into workable categories to help you better plan for preparation and cooking. Cover a baking sheet with foil and spray the foil with nonstick cooking spray. In a medium saucepan, combine the water, light corn syrup, and sugar over medium-high heat. Stir until the sugar dissolves. Then wash down the sides of the pan with a wet pastry brush to prevent sugar crystals from forming. Once the sugar starts to boil, insert a candy thermometer and cook the mixture without stirring until it reaches 260 F (126 C) on the candy thermometer. When the sugar syrup approaches 245 F (118 C), start whipping the egg whites on medium-high speed. You want them to reach firm peaks just as the sugar syrup reaches 260 F. If they reach firm peaks before the syrup's at the right temperature, turn the mixer off so they don't become over-beaten. When the syrup is at 260 F/ 127 C, remove the pan from the heat and carefully pour the hot syrup into a measuring cup with a spout. With the egg whites at firm peaks and the mixer running, slowly pour the hot syrup into the whites. Once all the syrup is in, beat the whites until they are very stiff and the mixture just starts to lose its gloss, about 3 to 5 minutes. It becomes difficult to work with if it's over-mixed, so be careful to monitor it while beating. Once stiff and shiny, add the vanilla extract and fold it in with a spatula. Scrape the divinity out onto the prepared baking sheet and let it cool completely, for about 1 hour. Once cool and set, you can proceed with the rest of the recipe. Melt the white chocolate in the microwave and stir until it is smooth. Set it aside to cool to room temperature. Coarsely chop the divinity and fondant into large pieces, and place them in the bowl of a mixer fitted with the paddle attachment. Mix them together on low until the divinity and the fondant break down. Add the melted white chocolate and the salt, and mix well. Depending on the texture of your divinity and fondant, your candy might hold together well at this point, or it might be dry and crumbly. If it is too dry to easily hold together, add a little bit of milk, a spoonful at a time, until it can easily be molded into shapes but is not soggy. Add the chopped walnuts and stir them in by hand, scraping the bottom and sides of the bowl to make sure everything is well-incorporated. Shape the candy mixture into miniature potatoes about 21/2 inches long—each will also be approximately 2 1/2 ounces. You should get about 16 potatoes from this recipe. In a small bowl, whisk together the cinnamon, powdered sugar, and cocoa powder. Roll each potato in the cocoa mixture until it's completely covered. Press pine nuts into the potatoes to resemble the "eyes," or use bits of broken walnuts instead. Store Irish potatoes in an airtight container at room temperature for up to a month.